they're empty. 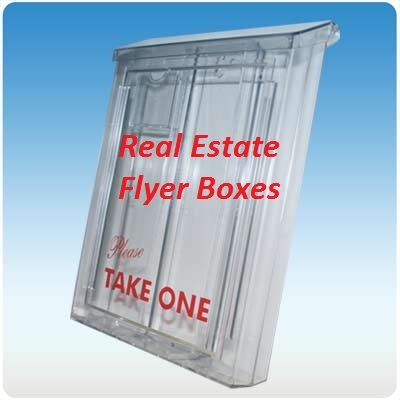 Flyer Boxes are thought of as 24/7 Sales Agents that work around the clock promoting your listings and services. They are also known as brochure holders, brochure boxes, solar brochure boxes, plastic brochure holders and counter top brochure holders. But whatever you call them Flyer Boxes are perfect for anybody selling real estate; including real estate agents, buyers sellers and investors. Typically, flyer boxes are lightweight and inexpensive, and can be mounted on many kinds of surfaces. Some even come with stakes for rapid mounting and use. But no matter how they mount they are near perfect tools for sharing information about properties for rent, sale or lease. Flyer boxes are now a common addition to "For Sale" signs all over the country. Real estate agents were quick to realize the tremendous value of a means for distributing information to "drive by" home shoppers. Below, for your consideration, are four companies that sell them. 1. REMSInfo, Inc. sells a variety of real estate supplies since 1990, including brochure boxes, agent name riders, banner displays, business card holders, stamps, stickers, yard sign posts, etc. Per information on their website they are the largest distributor of SUPRA Lockboxes and sell more Outdoor Brochure Boxes than any other distributor in the USA. 2. Real Estate Super Center also sells real estate flyer boxes, plus thousands of other real estate marketing products; like real estate signs, banners, lock boxes, calculators, brochure boxes, books, tapes, stickers and magnets, etc. 3. Sanzo Specialties sells brochure and information boxes, too; which are also terms for real estate flyer boxes. In business since 1948 they offer top quality, but economically priced products, including infotubes and ez mount boxes with mounting stakes. 4. BuildaSign.com is another company that sells flyer/brochure holder info boxes. Comparatively speaking though its offerings are significantly less than that of the other businesses noted above. Still, it's worth knowing about its sight as you never know when and where you'll get the best price on these items. Summarily, Flyer Boxes are great tools that will help you market your listings around the clock, 24/7. Place them in front of your listings and interested passers by can get the information they want without having to call you. And that's the idea, right? The more available the information the greater your chances of selling your listings.